This scroll is no longer available for sale. This is a photograph purchased from King Wu, a professional photographer in the state of Washington. This is a picture of a traditional Ukai (Japanese) word. Ukai is the term for trained Cormorants that the fisherman ties a string around the bird's neck and then the bird will dive for live fish. Due to the string, the bird can not swallow the fish. When the cormorant arises from the water, the fisherman takes the fish alive. This is still practiced in Japan as well in the city of Gifu on the Nagara River, but primarily as a tourist attraction. I used the blue silk cloth because it provided a good imagery of water. There was no Jikusaki put on this scroll, to focus on the photography. 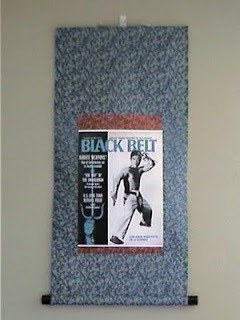 This scroll was made using a poster of an old Black Belt Magazine cover that was donated by friends from Aim Media. The featured Martial Artist is Fumio Demura with Sai. You can read about Demura Shihan by clicking on the link above. This scroll is made from a blue silk cloth imprinted with an ivy pattern. A Maroon and Gold Ichimonji separates the picture with the cloth quite strongly. I felt this is one of my most daring designs because of the strong contrast of colors between the cloth and work inherent in this Kinran cloth. The size of this scroll is almost an exact replica of the Gichin Funakoshi scroll posted earlier. This is a shikishi kake scroll. A shikishi is a hard matte paper that comes in various sizes. They are long lasting and very durable. The Shikishi kake frame is very convenient in that the work can be replaced as often as desired with other works. The writing on this is the word for Dragon (Ryu), written in a semi-cursive style called gyousho. See our website for more details on the different writing styles. This work was created by Ryugyoku Yamada. This writing fits the cloth pattern of the Orange and Purple Dragon. Dimensions of the scroll are roughly 36 Inches Long by 15.5 Inches wide. It is a beautiful scroll, which could provide a unique presence in home, office, resaurant or dojo. 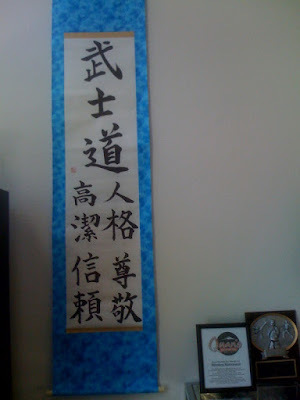 This scroll is an 8.5 x 11 inch picture of the founder of Shotokan Karate. A treatise on his history can be read at http://en.wikipedia.org/wiki/Gichin_Funakoshi. I chose a simple Red Wine colored cotton cloth for this scroll as Red is one of the colors of the Shotokan school. However, I chose a deeper red to enhance the contrast in the Black and White of the photograph. The Ichimonji is a Dark Blue with flowers which provides a smooth transition between the Red and the Black and White Photo. The scroll is finished with ornately laquered wood Jikusaki. This is one of the most beautiful scrolls I have created in its sheer simplicity and elegance. Dimensions of the scroll are about 30 Inches Long by 15 Inches wide with 3 Inch Hashira. This is a postcard made in a maru hyousou style scroll. Approximate dimensions are about 24 inches long by 16 inches long. The Hashira are approximately 1 inch and 0.5 inch respectively. This was one of my favorite places to visit in an area of Japan near Nakatsu called Yabakei. This was an area frequented by monks, priests and hermits for meetings of philosophical debate. 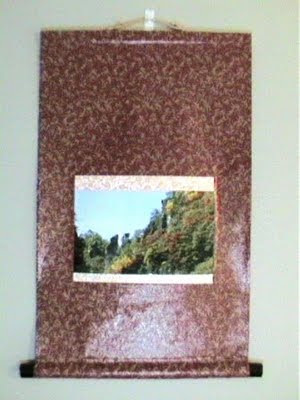 The beauty of the nature and the colors of the trees prompted me to use a veneered red cloth with gold leaves to remind one of the changing fall colors. Ooja Champion Scroll sold for $55.00 at the Long Beach International Martial Arts Tournament. Look soon for some new posts of scrolls sold.